A modern fence creates a stylish entry and enclosure for the dog. My client has a good design eye and she loves modern architectural style and modern style landscapes. However, her new home in Portland’s West Hills had a boatload of difficulties and she wanted a collaborative garden designer who would value her vision and strive to enhance it. The first view of the house as you approach from the street is the roof. It’s a classic landscape problem for hillside homes. This is as far from welcoming as you can get. You can’t see the front door at all. The amazing view is in the back and the front yard is small, shallow and often below the road. An modern styled entry courtyard would solve curb appeal, make a private sunny sitting area and give us an architecturally interesting entry appeal. I was prepared for hours of preliminary design to create the perfect enclosure for the courtyard. Instead my client found a photo that was the perfect inspiration and the design came to life. My client loves her dog. 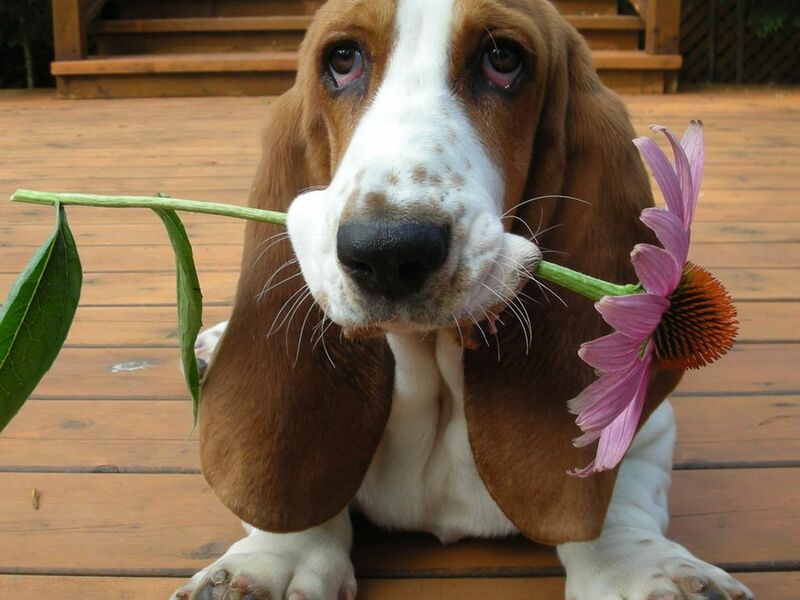 We needed to accommodate the family Basset hound. The entry area is the only easily accessible outdoor place for the dog. The idea of a Basset hound with such short legs going down three sets of stairs, so he can potty in the backyard is torturous and potentially harmful for his back and hips. The enclosed courtyard is perfect for keeping the dog safe from cars and predators. The fence would cut off views of the entry from the street even if it was a short fence. We accepted this and made the fence an attractive, visually strong presence on its own. We went taller with the fence to block the view of any parked cars and headlights. The courtyard fence needed to be subordinate to the house. This meant it could not be too visually powerful. Using the concrete wall at the base of the wood fence gave us two materials which adds interest and lessened the feeling of height from the street view. The height also steps down to follow the slope which makes softens the effect of it’s length. The fence line also steps back (or bumps out) to break up what would otherwise be a long straight line. Each section that steps back is the length of the 10 foot long entry windows. By repeating the 10 foot length in the fence sections, we easily integrate the house and courtyard fence. Repeating a line that is prominent in the architecture of the house in the landscape is a classic way to integrate the two together. The step back also creates valuable planting space along the inside of the courtyard walls. We removed the 1970’s brick facade on the house entry and replaced the tired aggregate and brick concrete walk with mortar set square paving stone. Plantings for the Courtyard Walls. The plantings for the exterior of the courtyard walls (out on the street side) are tricky. The first section has crushed rock. It’s designed for guest parking. The other step back sections create room for a mass planting of evergreen ornamental grass. Carex Morrowi ‘Ice Dance’ was the most low maintenance option. The entry gate area plantings are very simple and rely on two pots, one larger, one smaller and a very low bright lime colored evergreen ground cover to go around the pots such as cushion bolax, Azorella trifurcata ‘Nana’ . The charcoal colored dyed concrete base of the fence needs the relief of bright and light colored plants. We created the planting plan for the courtyard interior, and designed an echo chamber water feature to enhance the entry experience and to enjoy while sitting outside on sunny days. The existing rockery style walls inside the courtyard were built with stone that was too small. It doesn’t look great with the new modern style. Our design replaces 1/3rd of the retaining wall with large boulders. It is surprising to see that large boulders look and feel so good even in small spaces. Small rock jumbled together to make a wall is rarely attractive and is far from a modern style landscape. The final touches of the design are still in progress and I am looking forward to seeing the plantings completed. My client Sherry has been in her new home and garden for about 5 years now. She has kept me informed about her garden adventures so I’m sharing them with you. It’s great to see people having fun with edibles and her garden and experience show how much you can learn over time and the rewards of yumminess that result. Here are excerpts lightly edited for clarity. My garden is thriving. Be careful what you wish for. You know that fig we transplanted from the old house that I didn’t think would make it has thrived. I had to learn how to prune it for fruit production. At first I pruned it in the winter then I learned that I had to wait until after the late spring early summer harvest to prune it. This way the tree can put on new growth for next years crop. I didn’t know that figs only grow on last year’s new growth. I’m not sure what variety I have, it has green skin and pink flesh. The July harvest is plentiful but determinate—all fruit ripening over in a 2 week period. I had to give a lot away to neighbors and the food bank to keep from wasting them. The fall crop was small so I have taken to doing the pruning in late summer which impacts the fall crop drastically….which is fine. Here is my berry harvest schedule: We start in April with the Honeyberries-great in yogurt or muddled in a sparkling vodka drink. May brings the early hood strawberries followed by the blueberries and then raspberries. Salal – a native evergreen shrub I love to eat the bitter but flavorful berries that set in late summer. “I set it up with 2 grafted varieties in 2 rows, but this year I added the third top row because I had the room on the fence. One year I had a very low production rate due to the wet spring causing poor pollination even though the pear trees are near my extensive mason bee hosting program. To combat this I have learned how to hand pollinate and this was so successful that in 2017 I had to provide extra support to the limbs because the weight of the fruit was threatening to damage my tree’s structure. I harvested 99 Asian Pear – 100% success rate!! Sherry is a Clackamas County master gardener and enjoys her garden on an 8,000 sq foot lot in Milwaukie. 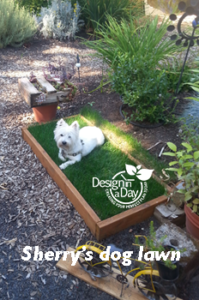 She has a tiny lawn for their dogs so the rest of the garden is dedicated to entertaining space, plants, edible plants, mason bees and love. 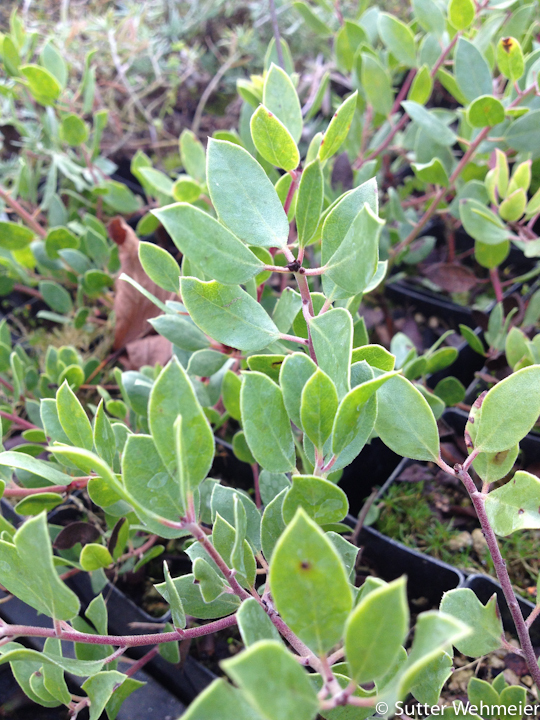 Manzanita (called Arctostaplylos – Arc toe staff eye loss) is the new cool darling plant here in Portland. The reasons why are numerous, unique “new” plant, drought tolerance, attractive in winter and all year, and there are now many diverse shapes and sizes to work with that will survive here. Years ago I only used this plant for a plant collector garden because they knew it was a crap shoot as to whether it would survive at all. 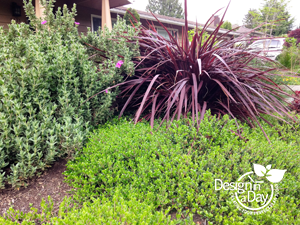 As a Portland landscape designer I want plants that will serve many purposes in my designs. For people who are done with the overuse of Rhododendrons and Azalea and want drought tolerant plants, Manzanita is the perfect plant. Before you fall in love, I want to give you some tips for succeeding with Manzanita in Portland. They have requirements that must be met if you want them to thrive. 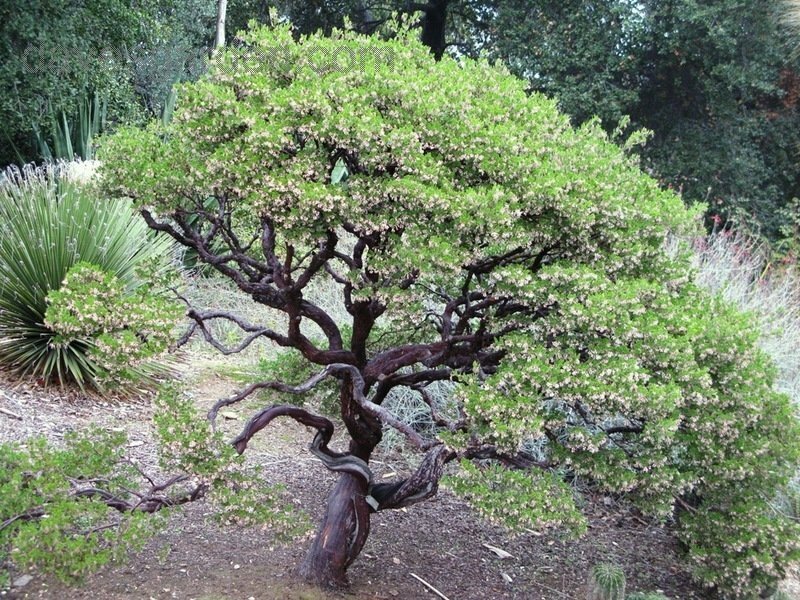 Please see my previous blog “Portland Landscape Designer Advocates use of Manzanita in Xericscapes”. Most are intolerant of summer water….clients must understand that they cannot coddle these plants, they cannot plant annuals with them for summer color, they cannot fertilize, they cannot water these plants after they are established or they will die. nt or xeric styled plantings. Most of the Manzanita I am using are too wide for a 30” parking strip. Planting companions must have the same no water requirements because it’s hard to remember not to water one plant and that you must water the one next to it. If any kind of auto irrigation is used the first summer it must be disconnected, dismantled, hell-dismembered so no one accidentally waters that second summer. 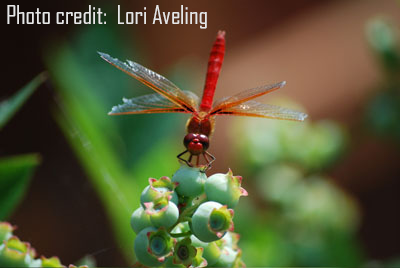 I select companions from Mediterranean or NW native plant palettes. Some mid west native prairie plants also work well with Manzanita. Herbs, ornamental grasses and xeric perennials like Penstemon or ice plant are easy companions and Heather (Calluna Vulgaris types) are one of my favorite for texture contrast. than a larger plant with a higher survival rate. Large sizes of these plants are not available anyway. Many of these plants will be available in a 4” pot or perhaps a quart sized pot. 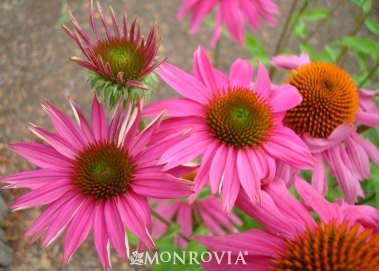 Smaller plants make more sense in this case but don’t expect them to be inexpensive. You are paying for all the research and extensive work to create these new plants. The trial and error approach for picking which one to buy and where to plant it is going to be very frustrating. There are quite a few new plant types to pick from and some grow very fast, some slow. Some may be pruned hard because they have a burl (what’s a burl?) and others would be ruined with such treatment. Your Portland landscape designer needs to be an expert or have access to one. If you are on your own, buying from Cistus Nursery or the retail store Xera Plants, Inc. is the best way to get the expertise you need from their very knowledgeable staff. I talked to Alana Chau at Cistus Nursery. Here is her list of plants that will be available that I especially liked. Arctostaphylos hookeri ‘Green on Black’ 18” high and can handle some clay soil. Arctostaphylos × media ‘Martha Ewan’ is a nice size maturing at three feet tall and it can be tip pruned. It gets wide so give it room to be 4 or 5 feet wide. (We designers get excited about plants who fit into a small landscapes so we might be more excited that this burling option than you are). 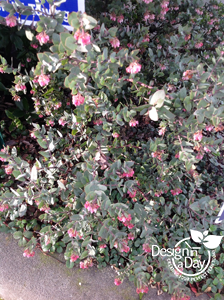 Why am I excited about using Manzanita in my Portland landscape designs? 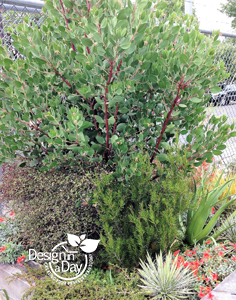 To advocate the use of Manzanita is to advocate the use of drought tolerant plants. Happily we landscape designers are encountering more clients these days who want a low water landscape or want a completely drought tolerant yard. I can advise about the site conditions drought tolerant plants require and select attractive plants that meet the curb appeal test in addition to drought tolerance. It’s a new look for the landscape. My younger clients are done with rhododendrons and azaleas, which are somewhat over used here. While Manzanita has attractive flowers, it is the whole package, foliage color, shape of plant, bark color and flower that is creating the popularity. I’m especially happy with the boost these plants give to the winter landscape. These plants are too naturalistic for formal landscapes but they look great with modern and craftsmen homes. Style-wise Manzanita fit nicely with NW natural, Mediterranean or even a southwestern look. We get strong foliage contrast with leaf blades (Yucca or ornamental grass), tiny needles like dwarf conifer, heather (calluna type), lavender or fat leafed succulents like hens and chicks or sedum palmeri or other sedums. 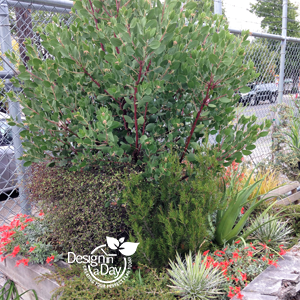 Drought tolerant Manzanita in Portland garden design as foundation plant. The fact that we now have more than one kind of Manzanita we can use can be laid at the feet of a handful of people who have crossed different kinds of Manzinita to produce plants that can thrive in our rich Willamette Valley soils. They then tested the plant in different soil conditions and identified the plants that can handle life in an non irrigated garden or landscape. When I started my Portland landscape design practice in the 1990’s there was a native Manzanita tree from the Oregon coast that “sometimes” survived here. They are so beautiful that I was tempted. Still “sometimes” was not good enough for my designs. I needed cold hardy Manzanita ground covers, shrubs, and small trees that would thrive here in the Willamette Valley and there weren’t any. Now I have them!!! This benefit could take some time to realize. Manzanita leaves contain a substance that discourages weeds. Leaves that shed from the plant should be left in place. It takes several years for these small leaves to build up enough of the substance in your soil to be effective. 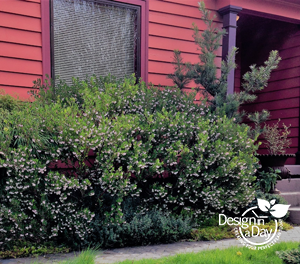 One of the common mistakes with Manzanita is to underestimate the width of the shrubs and small trees. Most cannot be pruned heavily and can be rendered so unattractive by pruning that tries to contain them, they will be removed. If you have no pruning skills (and most people don’t) be sure to place these plants where they have room to mature with yearly tip pruning only. Where to find these plants? While Xera Plants, Inc. and Cistus Nursery are the primary resource for retail, there are the Hardy Plant Society Sales (spring and fall) and tried and true mail order plant resources. If you are wanting drought tolerant landscaping and need a landscape designer contact me, I love to design with Manzanita. 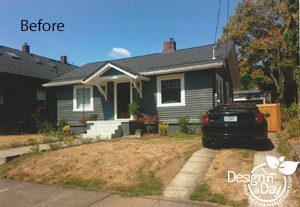 This NE Portland bungalow landscape design project was a joy. My charming client had a new home that was beautifully updated on the inside but the landscape was a blank canvas and a bit rough. It needed a landscape design to address new walks, driveway and create strong presence. The large houses on either side dwarfed this sweet house. Look at the great lines of the porch!! I loved this house at first sight. New driveway, low maintenance plantings, no lawn front yard, low water plantings and lots of colorful long season plants. Everything, including front walk and driveway, needed to be carefully designed to enhance function and curb appeal. The proportions of the driveway and front walk required updating because life has changed a lot since 1940. Middle class homes in the Montavilla neighborhood had cramped narrow walkways and no pedestrian access to the front door from the driveway. People parked their one car in the driveway and entered their home through a side door. Usually the man of the house came in and hung his coat and hat on a peg on the basement wall and came in to the house via the kitchen. We are talking “Father Knows Best” era here. I felt the house needed to be integrated into its land, that it was cut off and floating. We needed multiple planting levels supported by an informal rockery style wall. The levels are softened by the plantings which keeps the whole landscape integrated and inviting. Here is a designers’ trick, planting the area in front of the wall is an invitation and keeps the wall from feeling like a barrier. Erysinium – Wallflower ‘Wenlock Beauty’ on the right, Sedum ‘Purple Emperor‘ on the left and Thymus Praecox – Red Creeping Thyme in foreground. I’m very picky about driveways. They need the right proportions to be a functionally usable space but still fit into the landscape not dominate it. I want to make it comfortable to get in and out of the car with groceries, kids and pets without stepping into mulch or plantings. I hate having to negotiate through awkward uncomfortable spaces. “I hired Carol to create a design for my front yard and driveway replacement and to check in and work with the contractors during the installation process. Carol recommended Donna Burdick’s company D & J Landscape Contracting to implement the plan and I’m glad I chose them as well. Donna and Carol have worked together for years and speak a common language which made for a seamless experience. Carol is very flexible and can work with wishes of any level of detail. I had mostly vague, general ideas and preferences. 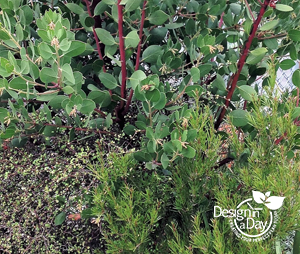 She was able to take those and come up with something that I loved as soon as I saw the first rough layout.” Denise L.
The parking strip tree is Parrotia persica – Persian Ironwood and the Gingko trees are ‘Jade Butterfly’. I selected a dwarf tree so the colorful sun loving plants under the trees will thrive.